The AutoGyro MTOsport is a two-seater gyrocopter with an all-metal frame and developed and built AutoGyro GmbH at Hildesheim aerodrome in Germany. The AutoGyro MTOsport is the successor of the AutoGyro Europe MT 03 built by HTC at Hildesheim aerodrome in Germany on behalf of AutoGyro Europe GmbH. The MT03 was designed by AutoGyro Europe GmbH and HTC in 2002 and was flown first in 2003. The MT 03, a so called Ultraleicht Tragschrauber, was the first autogyro which received the German UL type certification from the DULV (German Microlight Association). The process of certificating of the two-seater gyro started in the summer of 2003 when AutoGyro Europe GmbH applied for the certification. On 28 October 2003, they received finally the precious piece of paper. The MT03 is certificated in two versions: a basic open-frame gyro like the D-MILL and a more comfortable version with composite windscreens, etc. For the rotorsystem of the MT03 the proven extruded anodised aluminium NACA 8 H 12 rotor built by Air Copter is used. The aluminium rotorblades are available in different lengths: diameter 6,50m - 8,40m. The MT03 has a composite 3-blades propeller. The engine used is the Rotax 912 ULS (100 HP). With the Rotax 912 ULS, carburator heat and temperature gauge is standard. The MT03 has a range of 400km at a speed of 130km/h; the max speed is 162km/h. Since 2007, the company AutoGyro GmbH is producing the gyros in series. In 2008, the AutoGyro MTOsport was introduced as a further development of the MT 03. The MTOsport received the German UL type certification from the DULV on 14 April 2008. Today, over 1000 MT 03 and MTOsport gyroplanes are in use worldwide. 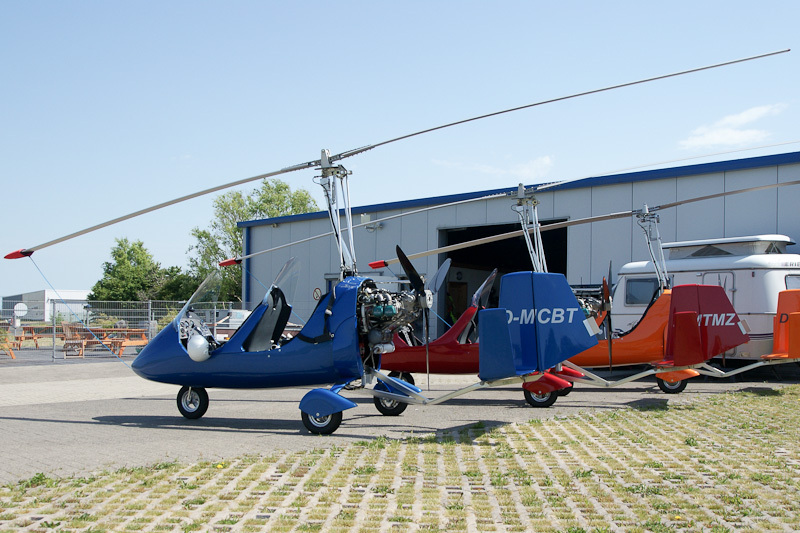 On 9 June 2014, AutoGyro MTOsport c/n M01045 D-MCBT, operated by Tragschrauber Flugschule Thomas Kiggen UG, Hildesheim, was seen parked next to its sistership AutoGyro MTOsport D-MTMZ at the location of this Ultraleicht Flugschule at Hildesheim airfield in Germany. The gyrocopter is powered by an air-cooled Rotax 912/ULS 4-stroke engine.